The Thames Barrier is to close this morning and reopen this afternoon to ensure London is protected from the risk of flooding. Communities are warned to be prepared for a coastal surge which is forecast today. As a precaution the Environment Agency will close the Thames Barrier at 10am and re-open it at 4pm (5 October 2017) to reduce the risk of possible flooding in London and along the Thames catchment. During today’s closure the Thames Barrier, along with the associated gates and embankments, will be operating as part of our network of defences, protecting over 550,000 properties. The Thames Barrier is one of the largest moveable flood barriers in the world, protecting 125 square kilometres of central London. It stretches 520 metres across the River Thames at Charlton and each gate takes 10 to 15 minutes to close (1.5 hours for total closure), and the control room is manned 24 hours a day, every day of the year. We are closing the Thames Barrier to protect London from the threat of flooding due to high water levels around the time of high tides from the sea. Practical advice on preparing for flooding can be found on GOV.UK or by calling Floodline on 0345 988 1188. 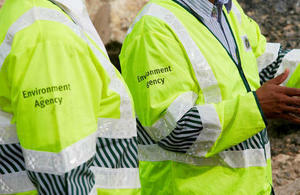 Communities can also follow us on Twitter at @EnvAgencySE and #floodaware for the latest flood updates. For all media enquiries please contact 0800 141 2743 or email southeastpressoffice1@environment-agency.gov.uk.